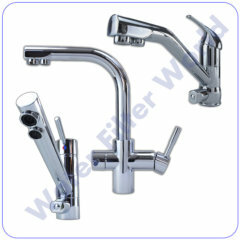 Triple flow taps supply hot, cold and filtered water so there is no need for and extra taps on your sink or worktop. Triple flow taps are a brilliant solution if you have marble or granite worktops or just like to have a tap that does it all. The filtered water is separate to the hot and cold water supply so the filtered water will not mix with the unfiltered water. To ensure the filtered water stays separate from the hot and cold water it has its own pipe running up through the tap. There are also two diffuser on the tap spout one for filtered and one for hot and cold water. The hot and cold water is controlled with a mixing valve to turn the water on and off or to get it to the correct temperature.